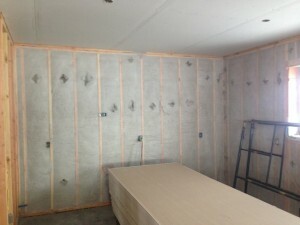 Insulation may not the most glamorous subject, but it is what keeps the house efficient and, most importantly, comfortable. 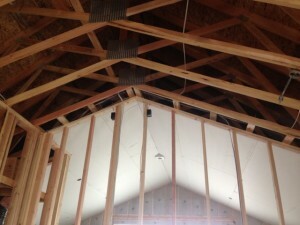 We have 12 inches of blown cellulose insulation in double offset stud, exterior walls. For additional protection against air infiltration we add another inch of high density insulating foam under our stucco system. This gives 14 inch thick exterior walls with no thermal bridging and minimizes cold infiltration and heat loss. Two feet of blown insulation in the attic reduces heat loss through the roof. R90 ceiling insulation, R50 wall insulation—now that is a comfortable house. By using blown cellulose insulation, we eliminate off gassing found in other insulation materials and keep indoor air quality high.